September 19, 2011 By George Vondriska & filed under Skill Building. The next time you’re working on a project that calls for a dark, opaque accent that looks like ebony, try ebonizing wood for the right look. It’s a fairly simple process, but works better on some woods than others. Ebonizing wood is not the same thing as simply coloring wood with ebony stain. When you ebonize wood, you’re causing a chemical reaction that makes the material turn black. The benefit to this process is opacity. When wood is stained you can sometimes see the grain through the stain. When wood is correctly ebonized it becomes pitch black, and you won’t be able to see grain through the color. It’s important to understand that this is more art than science. You should definitely experiment before using this technique on a project. Suitable Woods. Ebonizing depends on the wood having a lot of tannin content. As a rule hardwoods have more tannins than softwoods, and dark hardwoods more than light hardwoods. That makes oak, cherry and walnut good candidates for ebonizing. Birch and maple are not good candidates, but I’ll show you a way to work around their shortage of tannins. Even among the usual suspects there’s tannin and there’s tannin. One piece of walnut may ebonize completely differently than another. You’ll need to experiment with the pieces you’re using to see what it takes to get the results you want. What You Need. Ingredients for ebonizing are all household items. Tea, steel wool, and vinegar. Ebonizing Requires Iron Acetate. The reaction with tannins is caused by iron acetate being brushed on the wood. Don’t run off to the hardware store looking for it. It’s simple to make. Start by washing the steel wool with soap and water to remove any oils. If you don’t do this the oil may prevent a reaction with the vinegar. With the steel wool in a glass jar, pour vinegar over it. You’ll know it’s working when bubbles are coming off the steel wool. Bubbles should start to form within minutes of the vinegar contacting the steel wool. You can cap the jar, but cap it loosely. The gas must be allowed to escape. The steel wool and vinegar need some time to react; a couple days would be good, a week would be better. If you suddenly realize you need iron acetate for a project NOW, you can accelerate the reaction process by heating the mix in a double boiler. Gently heat the mix for a couple hours, then let it sit overnight. You should be able to use it the next day. I bought the hot plate for my shop at a thrift store. It’s earned its keep a number of times. In addition to making iron acetate, make yourself a nice pot of tea. Steep 10 tea bags in a quart of hot water to make a really strong brew. The tea will be used to add tannins to wood. A good jar of iron acetate will look pretty icky. Remove particles from the iron acetate by pouring it through a coffee filter. Do Some Testing. Brush the iron acetate on to some sample boards and see what you get. Results are not instantaneous. Elapsed time on these boards is two minutes. The tannin-heavy woods-walnut, oak, cherry-are much darker than the other woods. Want things to get even darker? Add tea. Brush tea on to the wood and let it dry a little. I find results are best if the tea is slightly damp to the touch when brushing iron acetate over it. The tea really helps. The top board is birch with tea and iron acetate on the right, iron acetate only on the left. The bottom board is walnut, raw on the left and iron acetate only on the right. The center board is walnut with tea under the iron acetate. It’s significantly darker and more opaque then the other walnut board. You can also brush tea on top of the iron acetate. The bottom line is that tea has a lot of tannins in it, so it’s a tannin-additive for low tannin woods. Ebonizing only affects the surface so machining, such as routed profiles, should be done before ebonizing. The ebonizing process may raise the grain, especially if you use tea. It’s a good idea to do a pre-ebonizing grain raise. Brush on a little water and, after the wood dries, sand off the whiskers. That should prevent you from having to sand the ebonized piece and taking the risk of sanding off the ebonizing. The iron acetate needs to get into the wood, so don’t sand finer than 220-grit or you may prevent the liquid from soaking in and having the chance to react. Give yourself ample opportunity to experiment with this process before using it on a project. Keep the test boards and record how you made them. Click here to watch a related Ebonizing Wood video clip. a 50/50 mix of apple cider vinegar and water and let it sit. Strain off the liquid and use for ebonizing. I’ve been using this same jug of nails for more years than I care to admit. Whenever I need a fresh solution I just add more water and vinegar and within an hour or so have more when ever I need. The black tea trick mentioned above is a great tip also for increasing tannin content to lower tannin woods. I’ve used this technique in various forms from complete black ebonizing through sanded afterwards to offer more contrast. 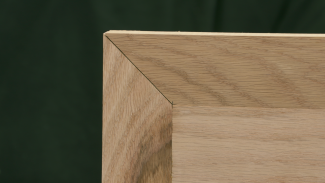 Another technique is to back fill open grain woods like oak, ash, hickory with a contrasting color. For this I’ve used a wet lime paste (think plaster of paris) as well as latex paints. This is a variation on pickled wood techniques from a bygone era. Apply a dilute latex paint, (use the appropriate solution for the type of paint being used) I most often dilute latex with regular paint thinner. I part thinner to 3 parts paint. Apply this and wipe down surface with a clean, thinner dampened cloth to remove excess paint from the surface. You just want to back fill the open grain. Apply several times to really fill in the grain. You can hit the surface lightly with a bit of thinner on a green scotchbrite type scrubbie. Allow to dry between coats. If your ebonizing is not as dark as you would like after this just reapply your ebonizing/ black tea solution to bring it back. This will add some working time to any project but the results are worth the effort. Interesting article and very interesting comment from Mr. Woodright… Thanks!! Is one particular type of tea better than another? 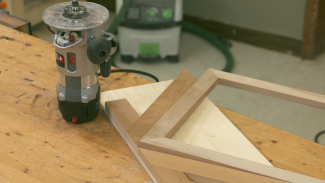 I was thinking of routing a shallow groove around drawer fronts, or maybe using this process on routed signs, then sanding off the treatment on the upper flat surface…. Almost instant highlighting with a little bit of extra sanding to do… OH the possibilities – Thanks again! You can use whatever topcoat you would like following ebonizing. I’d suggest waiting 24 hours prior to applying topcoat to allow for full drying and as well as to allow for any chemical reactions to fully stabilize. Could you make dark plugs for holes and decoration in Mission style furniture? Will the Black wood take glue? Glue adhesion would be fine for this application, but the ebonizing process does not go very deeply into the wood, so when you sand the plug flush it would remove the dark coloration. I suggest getting some black walnut for this purpose instead. for smaller pieces of wood like door knobs and dowel etc. can you let them soak into the ebonize color say for a week therefore penetrating the wood deep would this allow sanding afterward and not sane the think layer of ebonize color off since it deep within the wood. I want to create a gray weathered look on resawn skip sanded douglas fir flooring. I was told that the floor may change color possibly at some future time. Any experience with that? Thanks for the interesting post. Would this treatment be food safe? Please see the attached cutting boards that make reference to using tanic acid to develop a “durable, food safe dye” – http://www.blackcreekmt.com/blackline.html. Would you agree with this? Thanks for your assistance. The process that they are describing is probably using ammonia to “fume” the wood, which causes a chemical reaction and creates a dark color in oak. If general, ammonia is an extremely toxic substance, so if that is what they are doing, then I’d be concerned. But they might be using some other approach this is food safe. I’d suggest asking them directly what process they are using, and what science they are basing their claim of “food safe” on. i’ve replied a few times to ensure there is no misrepresentation of our products & finishes on this thread. the process we use in NOT toxic. we do NOT fume. i’d be happy to answer anyone’s questions about our processes. you can email us directly. Hi, Kelly! You may contact us at 1-855-253-0822. Back to what Cindy was asking about this particular process, ebonizing (oak in particular) wood with iron acetate. Is this food safe? I make wooden flutes and would like the ebony look, of course people put their mouths in direct contact with my instruments so I have to be careful. I work with fairly dense burl wood with beautiful grain. In my profession the higher contrast you can achieve with the grain the more valuable. To achieve the contrast I apply a dark stain then gently sand it off leaving the dark grain a dark color and the lighter wood light. Then I apply a lighter top coat that colors the light wood. And bam cotrast achieved. The problem though is there is a lot of color blending when the top coat is applied not achieving the high contrast I would like. That being said does this stain method mentioned in your article chemically alter the grain in a way that if I where to implement my contrast method ie lightly sanding the wood, the grain would be chemically stained there,fore not mixing with my top coat? Hi. Your process sounds very cool. I’ve done the first step that you describe on figured maple with transtint dye and achieved very good results. I haven’t taken the next step and added additional coloration, but I can see where that might be problematic. I haven’t tried applying a non-clear topcoat on wood that has been “ebonized” using this process, so I don’t know for sure. My hunch is that it would tend to blend less than traditional stain, and it is worth a try on some scrap. I would also suggest trying transtint dye. Depending on the species that you are using, and the size of your project, you might want to try ammonia fuming as well. That should not give you any problem with blending colors. It might also bring out some of the figure better in the burl better than stain. Maybe. 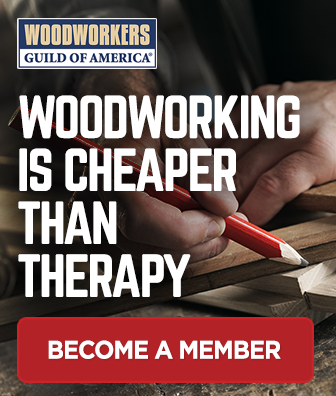 If you haven’t done fuming before, the process is described in Seth Keller’s article here: https://www.wwgoa.com/article/an-authentic-arts-and-crafts-finish/. I’ve had great luck using the janitorial strength ammonia from Ace Hardware. Be careful with that stuff. Please let us know what you find if you explore any of these options. I’d love to see some pics of your projects as well. Hi. I have been experimenting with the steel wool/vinegar reaction to woods. I love what it does on oak but before I discovered it I bought raw hickory flooring straight from the mill. I am doing the ‘add tannins w/ tea’ in experiments. I get a gray color that I love. HOWEVER, I would like to figure out how to get contrasting grain a little darker and I’m confused about which part is more pourous and how it reacts to the tannins. Is there anything other than tea that would give me more tannins so that I could come closer to the ebonizing that happens with oak? Hi, Nikole. Good question. Unfortunately, I’m not aware of anything, but if you come across something, please let us know. This was really helpful information. One question: My old turned wood oak table has a finish on it. How can I best remove the finish without adversely affecting the ebonizing process? Can I send it to be vat-stripped? Thank you for your help. Hi, Valerie. I do not know how the stripping process will affect the ebonized look of the wood. 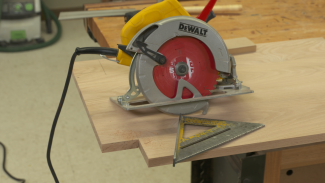 I would suggest trying this on scrap before working on your actual table. I have read that you can also get wood to change to a dark color by heating it in a oven, do you know anything about this. Sorry, I have not tried this so I can’t confirm. We have been ebonizing all sorts of wood with great results. However, I have run into issues where sometimes there are spots that won’t take the color at all- whether it is sappy or what, I don’t know. Some of this might be in a crack (we do a lot of live edge work and not everything gets resined) or, with elm, I have found that the more open grain does not always take the color. Any ideas for how to blacked the areas in the crevices? Or have you experienced this before? I was tempted to just take a very tiny brush and apply a dye as it is not directly next to the flat surfaces that did take the stain, but was curious to hear if there were other ideas. I also should add that we use a quebracho tea to add tanins to woods that do not typically darken enough…but there are still areas that just don’t change color at all. This is a fairly uncontrolled way to color wood, and so far I’ve only done this with an attitude of “I get what I get when the process is complete”. I haven’t experimented with how to even up and appearance. I suspect that you could do this somewhat with experimenting with adding tannin, or using dye or stain, but at that point I believe that I would forego the ebonization process entirely and start with a good quality dye product such as Transtint. With Transtint, if you get any unevenness in penetration or coverage, you can even it up by adding some additional dye to your topcoat, which can knock down some of the color discrepancy. I’ve spent a huge amount of time building an oak armoire by hand and now doors with a fine patterning and japanese washi inspired doors. The wardrobe closet itself was already ebonized years ago and now I am staining the doors. I am getting this unevenness, too and because I used different parts of oak to create the pattern, it looks unnatural that some pieces are very off. Hopefully I can adjust with tea. The sap theory seems okay although any sap present is not obvious in my case, best I could come up with is that it might matter how old and exposed the wood is… but actually I find relatively little difference in stain color between rather recent oak and oak I got from a demo source which may be well over a century old. Another thing I am trying to wrap my head around (and try to remember from staining the rest years ago) is that when wet the wood can get pretty black-ish and beautiful but then goes dull. At first I thought iron is oxidized to rust (the insoluble iron (II) oxide) but now I think it is just the iron acetate itself which is brown and insoluble in water. This also explains the nasty frothing appearance of creating iron acetate, it is being created and then deposited, etc etc – it may be a little pointless because it should be so easy to achieve a saturated solution since hardly any can dissolve. Not sure how much iron (III) hydroxide etc is formed besides that – it is really the iron (III) you need in that solution, the salt form seems less interesting. Iron acetate is soluble in alcohol though so I would very much like to experiment with an alcoholic solution of iron acetate. However I am at risk of getting a mismatch with the rest of my wardrobe. Also maybe it is a terrible idea that just encourages the brown to be absorbed into the wood making it nigh impossible to buff off. I haven’t applied tea to my doors yet, because when I tested both the new and old oak, actually what caught my attention is that very small parts I had not applied tea to turned nicely dark without any dull brown layer. By the way like before I will apply a PU clear lacqer sort of product to protect and seal the wood (silk shine only). I highly recommend this for both durability and a sheen effect synergizing incredibly with the stain. And you’re right, it is more art than science in a way. I am thinking about doing a project with Osage Orange, considering its increased durability and even scratch resistance if it’s aged,however I don’t want the natural bright orange color for this project. I have heard that UV exposure (sunlight) darkens it which I might do to some degree. Although what I was really wanting to know is wether black dyes, black stains, or ebonizing (steel wool & vinegar) would be effective with this wood as it’s naturally so dense and brightly colored. Spencer, I just ran a little test with a chip of osage I had around. Ebonizing with iron worked, but does not seem to be as even as I’ve seen with other woods, so I would say there is a risk of yellow showing through in places. Did you try it on your project? I have been doing this for years and one thing that hasnt been mentioned is that if your ratio of steel wool (rusty nails or whatever you want to use) isnt correct, you’ll have a solution that is too weak (too much vinegar) or that has an orange tone (you’ll get dark brown not black). If you want a warm dark tone thats fine, but if you have too much metal what you end up with is iron acetate and ferric oxide (rust). Vinegar is only 10% solution in water. I personally would not let it sit for more that 2 days because you will end up with more rust the longer it sits, and ABSOLUTELY DONT COVER. This gives off hydrogen gas which will pop your lid right off (explosively so), and dont smoke or have open flame anywhere near your solution when it is reacting. If you are still seeing the bubbles its still reacting. If bubbles stop with lots of metal left you add vinegar. It is very much a trial and error process, and I advise anyone to practice first and its better to stick with woods with high tannin. It can be spectacular on an old red oak floor (especially if it has old urine stains that sanding wont remove). Scott, Thank you. I recently made my first batch of iron acetate, and it was exactly like you said, dark brown and it has an orangey tone. I wasn’t sure if I’d done something wrong, or if it was the wood I tested on. I’ve stuffed another ball of steel wool in there to try to fix the ratio. Thank you again, your comment was very helpful and not something I’ve seen mentioned on any page I looked at for instructions. Nice article. I also would look into a packet (small one) of tannic acid in whatever is you favorite place (amazon ?).. 50grs (2oz) is pretty cheap and you can do a lot with it. It’s specially useful if the wood is not dark and you want to crank things up. Thanks for the instructions on ebonizing wood. I plan on using this technique on some of my wood turned projects. Again thank you. PW. Can you do this on your deck outside? Hi Ruth. I have never tried this for an exterior application so I do not know how well it would hold up. Should you prestain the pine before ebonizing the wood? Hi Frank. I would suggest experimenting on some scrap and determining if you prefer the look with or without the pre-stain conditioner. You might not be able to get it as dark if you use this. I have cedar trellis. I have used the ebonizing technique on smooth oak. Can I spray the solution on? I can always brush it on, but not sure if spraying works. Hi J.J. Brushing should work fine as long as you apply enough of it. I would test on scrap to make sure that you get the results that you’re hoping for. we put in a hickory floor two years ago and used iron acetate to give us a great look and have been very pleased with it. We liked it so much that when we redid the rest of our house, we decided to put down more hickory and do the same process. However, we ran into an issue where we can match the undertones between the two sections. The original has a warm red feel and the new section is just turning black with a slight yellow undertone. Any ideas on what we can do to match the two or why we cant achieve the same end result? I have pics if that would offer some clues. Thanks. Hi Jason. Unfortunately this is a process that can be unpredictable because it relies on variables that are out of our control. If you want to even it up, I would look into supplementing the process with some dye. You might be able to improve your match through some careful experimentation on scrap. I would suggest trying this in varying levels of dilution: https://amzn.to/2oO1T5G, perhaps with a bit of this to add a red tone: https://amzn.to/2wU0xdc. I also had a very red looking finish when using the ebonizing process because of the tannins that the wood I was using had. I don’t know how to make it reddish but if you added tea everything would become . more black and look more like each other. Ticket 19321 Hi, Using your recipe for iron oxide I used it on a serving board, not meant for cutting. I used 2 different woods maple and what I thought was oak but the stained colour was a rusty not black at all. I made a tea and it went black which was terrific. However it is for my daughter who is so afraid of what is on the board for safe use wit food. Since tea, iron and vinegar is safe I wonder how to finish of the ebonizing so the finish will last and still look good when she cleans it. Please help me know what would be a good durable but safe finish for the ebonizing process. I’m not crazy about the idea of using this project for food contact. Rust on food seems like a bad idea. You could put a bunch of coats of this stuff on it: http://amzn.to/2CvstVw. With 5-6 coats of that, I believe that you would provide enough protection and not allow migratio nof rust particles onto the food. Because we all need s good amount of iron in our bodies why would rust be a problem when using it on a cheese type board? My expertise is in woodworking and I’m not able to provide you with any informed guidance on whether it is ok to eat rust. It just intuitively seems like a bad idea to me, and is not appealing to me, so it’s not something that I plan to research. Thank for this post. They are very great and clean wooden. It is very interesting article. We all good needs in iron body. I have used in Ebonizing wood . I will sharing in this post . I have a 100 year old piano from which the ebonized surface was removed. Apparently it was done with a commercial paint remover. It was then varnished with a urethane product. I want to restore the ebonized finish. The base wood is mahagony? I assume I will need to strip the varnish. Is this a hopeless task? What will be the best product to reve the varnish? Thanks for your help. Thanks for reaching out. Sounds like a cool project. Unfortunately I don’t have much experience in the area of refinishing (virtually none), so we are probably not a great resource for you on this project. I’d suggest consulting with a refinishing expert, particularly on a high value project like a piano.